There can certainly be debates about the limits of regulation. I once spoke with a Libertarian candidate for the Pennsylvania State Legislature who posited that all environmental laws should be scrapped. If a business polluted, those affected by the pollution can and should sue, he asserted. For reasons that should be obvious to any thinking person, that position is absurd. Pollution travels. Individuals lack the resources to map sources. Unless we don't care about the air that we breathe, the water that we drink, the food that we eat, we must collectively take responsibility in seeing to that which the Founders described as the General Welfare. In a modern state with hundreds of millions of lives in the balance, that collective responsibility cannot rely on civil litigation. That responsibility is housed in our government. And it is the responsibility of the electorate to empower the government to be both circumspect and scientific in promulgating rules and regulations. Here's where it gets tricky. Legal scholars have apparently agreed that "...Life, Liberty and the pursuit of Happiness..." in our Declaration of Independence and "...promote the general Welfare..." in our Constitution are not actionable phrases. Certainly not in The Declaration, since that document has no bearing on modern jurisprudence at all. And also not in the preamble to The Constitution, though perhaps some relevance when the phrase is repeated in the body as regards taxation. Indeed, in modern times the Supreme Court leans toward a doctrine that prohibits the consideration of any words that are not actually written into the body of The Constitution. Because that same SCOTUS believes that corporations are people and that money is speech. Show me where the Founders promoted those ideas anywhere, much less in the body of The Constitution. And of course, there's that nasty little phrase in the Second Amendment about militias. What can be more important to the happiness of people than their good health? Which form of government best promotes good health? 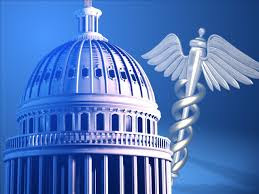 We often hear American elected politicians proclaim that we, that Americans, have the best healthcare in the world. If good health is indeed a prerequisite for happiness, that claim is central to whether or not those same politicians are serving us well. Let's examine that claim. And America spends more as a percentage of GDP than other developed countries. 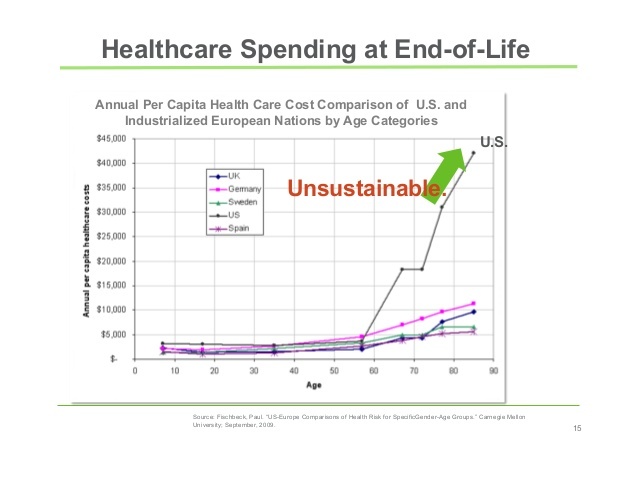 But life expectancy doesn't seem to correlate positively to that spending. And maternal mortality doesn't seem to correspond positively to that spending. 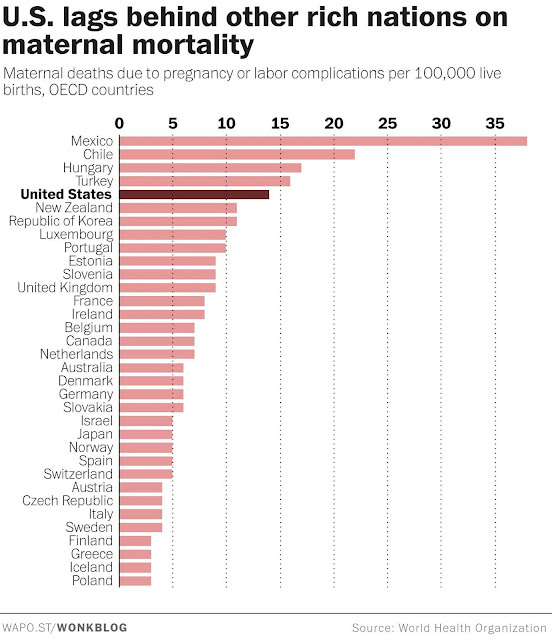 And infant mortality is, quite frankly, a disgrace. 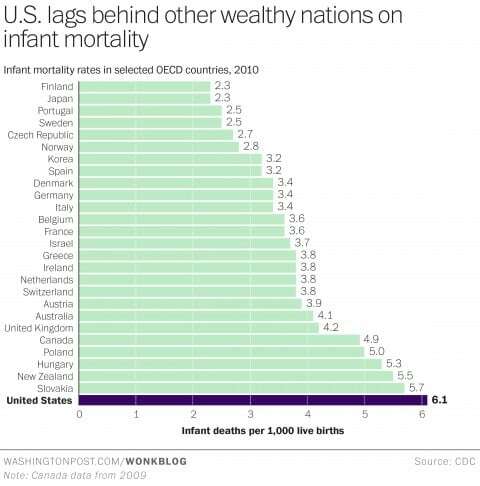 So is there any metric in which the US shows leadership? Yes. 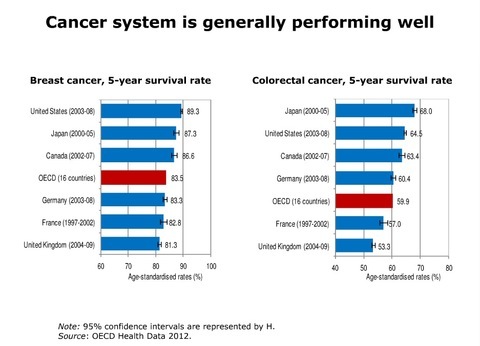 5-year cancer survival rates. But then I determined what I believe to be the reason why the US leads in that category. Spending, which of course, in the US relates to profit. There are those who might suggest that the lack of spending in other countries at end of life is due to rationing. But no one that I know in Europe has experienced a denial of service because of age. I have more than one friend older than 70, one older than 80, who received full treatment for cancers on the government dime with no questions asked. My take on it is that the difference is a quality of life issue. Europeans just think differently about how to live their lives than Americans do. It's why they insist on longer vacations and take full advantage of their vacation time. It's why they close businesses to vacation with their families even at the height of tourist season because that's when their kids are out of school. And I suspect it's why they don't demand invasive and costly procedures at the end of life. 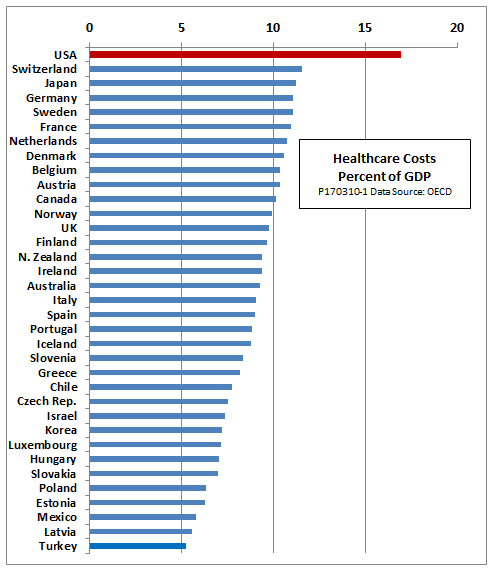 So, call the countries of Europe and those with similar healthcare systems Welfare States. They don't care. They pay for that welfare through taxation and, on the whole, they are happy to do so. My nurse sister-in-law described a conversation about single-payer healthcare that she had with a colleague, a colleague with a Ph.D. "But I believe in capitalism," said the colleague. What does an economic system have to do with healthcare outcomes? Apparently, the impact is almost entirely negative.